Here is your chance to be one of the first lucky travelers to experience the latest luxurious resort in the Bahamas. You can be a trendsetter who discoveries this amazing getaway spot while it is still a relatively well-kept secret, and then impress your friends with your in-the-know scoop. The Warwick Paradise Island Bahamas opened its doors to guests in October. The unveiling was the culmination of a huge construction project that represented a $40 million investment by Warwick Hotels and Resorts. 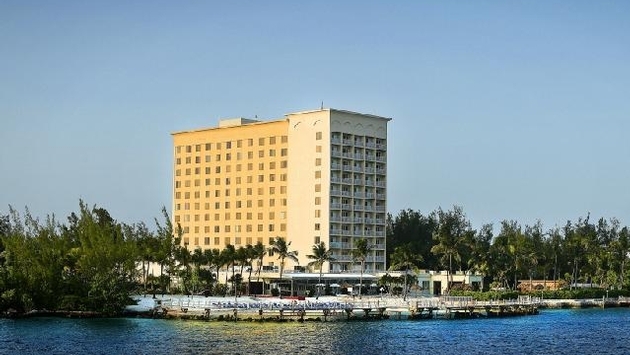 It was an investment that seems to have paid off, as the first initial group of visitors appeared to be awed by the stunning property, which is nestled in Nassau Harbour with views of Nassau and Paradise Island. The four-star deluxe, adults-only, all-inclusive resort has quickly become an in-demand premiere destination for those seeking an upscale getaway in the Bahamas. A perfect combination of modern and laidback, this resort is the ideal choice for travelers who are seeking a private romantic getaway, or a place where they can just relax and immerse themselves in their own secluded tropical paradise. It is everything you envision when picturing the luxurious utopian destination of your dreams. The sprawling property features many notable features, both inside the resort and all around the spacious grounds. One highlight: the 10,000-square-foot Warwick Sea Terrace overlooking the harbor marinas, complete with an arrivals’ dock where you can watch the incoming boats. The Sea Terrace also has an expansive boardwalk, including an area custom designed as a wedding locale. An outdoor steak and seafood restaurant is also located on the terrace area. All of the 250 rooms and suites in this 12-story property feature nice extras and perks such as multiple power ports and USB inputs bedside, and complimentary standard Wi-Fi internet access that spans from the “beach to the bedroom.” Some rooms also feature private balconies with terrific harbor views. The all-inclusive package means guests don’t have to worry about unexpected surprises on their bill. The stay includes all meals and snacks, alcoholic and non-alcoholic beverages, use of the fully-equipped fitness center, plenty of entertainment and activities, plus taxes and gratuities. You will never be bored, as the assortment of activities is virtually unlimited. Go snorkeling in the crystal clear turquoise waters, or organize a competitive game of beach volleyball along the shore. Guests have a selection of three restaurant offerings, two of which offer a la carte evening dining. Or opt for casual poolside dining of pizza, burgers and other great favorites. The two onsite bars provide drinks and entertainment every night. In addition, there is also a large entertainment facility located just off the lobby where you can see live entertainment, DJs, shows and other performances. The resort is easily accessible, conveniently located just a half-hour away from Nassau’s Lynden Pindling International Airport, and within walking distance of popular Cabbage Beach. Many shopping and dining options—along with other attractions—are also just a short stroll from the hotel. Make arrangements for your stay at Warwick Paradise Island Bahamas now.